Using this technique just once should give you a month’s worth of song titles. The lizard brain is the primitive part of our brain. It’s the part that processes emotional reactions, called the amygdala. Now, there’s a term used in the music industry: REACTIVE. Think back, the music you fell in love with wasn’t boring. It caused you to feel things. That’s what it means to be reactive: To be caused to feel things. Now, unless your song is being introduced to a new listener through their ears, like from a live performance, streaming audio, advertising, or some other way, you have to rely on the written word to get someone to listen. 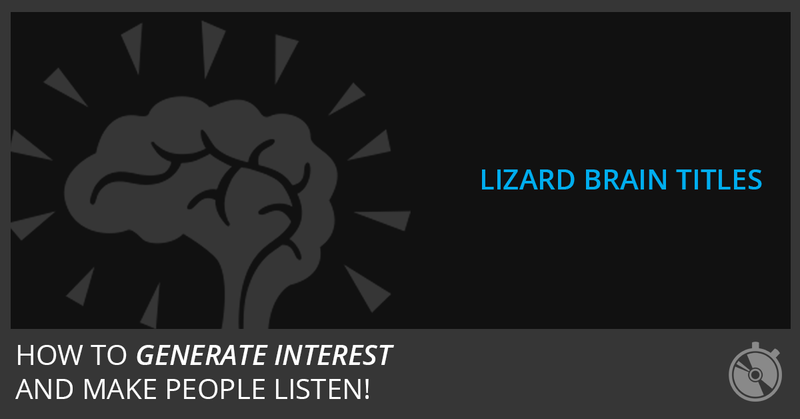 Lizard Brain Song Titles is a strategy to generate interest, make entertaining songs, and ultimately get people to listen and talk about your songs. Write song titles that cause people to react and feel something. Find out how to create Song Titles, Song Plots, and MORE in The Speed Songwriting System. Go to The Best of Huffington Post, a guaranteed source for words and topics currently pushing the hot buttons of millions of people. I use the Huffington Post for this technique because it has a massive readership and this particular list of content perfectly demonstrates the reactive principle. Tip: The Huffington Post is just one content source you can use. The Lizard Brain Song Title technique is designed to generate reactive song titles, but you can try it on any group of words. Next, use the Huffington Post’s content to create a word cloud with Wordle or WordItOut. Wordle and WordItOut are online word cloud generators. You can paste text or enter the URL of any blog (like HuffPo) into their word cloud generators and it will give you a customizable word cloud. From the word cloud you create, find unique combinations of 2-5 words that you find interesting or could start a story. The only rule is to create as many song titles as you possibly can in about 5 to 10 minutes. Look for power words and song ideas. Power words cause emotional reactions. You’ll know them when you feel them. Ideas for songs will be obvious and easy to flesh out once you’ve discovered how to use a song plot in The Speed Songwriting System. When any combination of words POPS out at you, put it in your list of song titles. Tip: You should have one document where you capture all your song titles and it should sync to all of your mobile and desktop devices so the list is always available. Next, choose the top five to seven titles that make you squirm a bit when you read them. The titles should at least cause some level of emotional reaction in you. Finally, pick one random title from your list of favorites. That’s your new song title. Head over to HuffPo and Wordle and write some Lizard Brain Song Titles! I see what you mean. Great advice. Thank you.